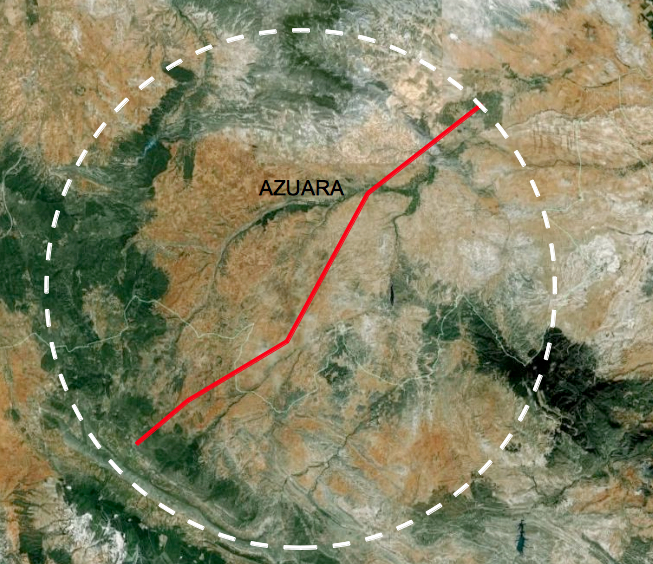 The 35 – 40 km-diameter Azuara impact structure is exceptional because of its purely sedimentary target of about 10 km thickness. Although this thick sedimentary target is to a large amount composed of carbonate rocks and quartzites, significant magnetic anomalies obviously related with the crater structure are measured (Fig. 2) [full article Ernstson, K. & Fiebag, J. 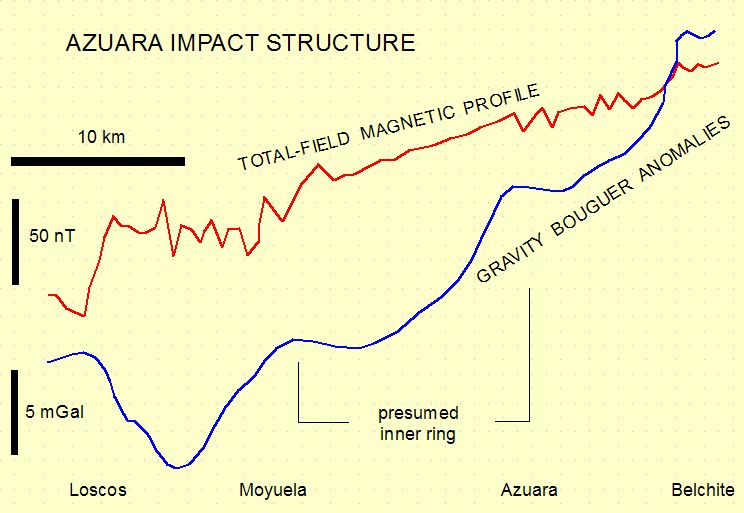 (1992): The Azuara impact structure (Spain): new insights from geophysical and geological investigations. – Int. J. Earth Sci., 81, 403-427; http://www.springerlink.com/content/h3817t72781601tn/. From rock magnetic susceptibility measuements it is very probable that the suevitic basal breccia [ http://www.impact-structures.com/impact-rocks-impactites/the-suevite-page/suevites-from-the-azuara-and-rubielos-de-la-cerida-spain-impact-structures/] must be considered the causative body of the anomalies. While crater carbonate rocks and sandstone have maximum susceptibilities of the order of 10 – 20 * 10-3 SI, susceptibilities up to 1.6 * 10-3 SI for basal breccia samples have been measured. Moreover, basal breccia samples may show a significant remanent magnetization. From the frequently distinct reddish color of the suevitic basal breccia we conclude that on formation of the basal breccia new magnetic phases occured possibly due to strongly enhanced temperatures at the same time responsible for a thermo-remnant magnetization. Geomagnetic surveys in the Chiemgau impact meteorite crater strewn field have so far been performed at two of the smaller craters only where significant anomalies and in part enigmatic rock magnetic properties were measured. 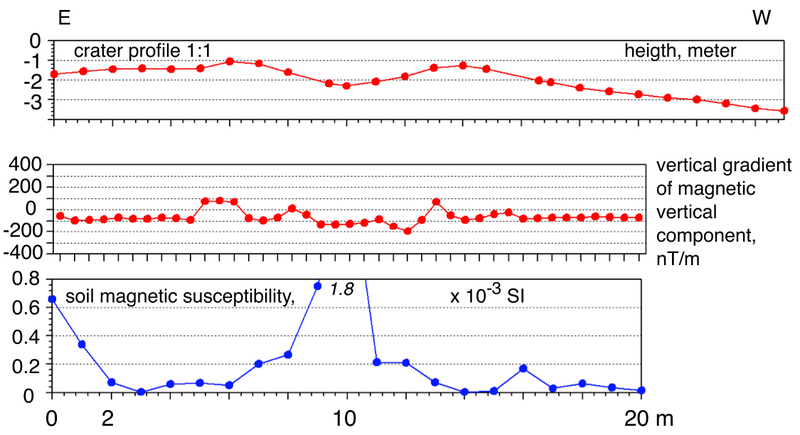 Shock magnetization processes have been considered. A poster contribution to the 2011 AGU meeting with some more information may be clicked. Fig, 5. 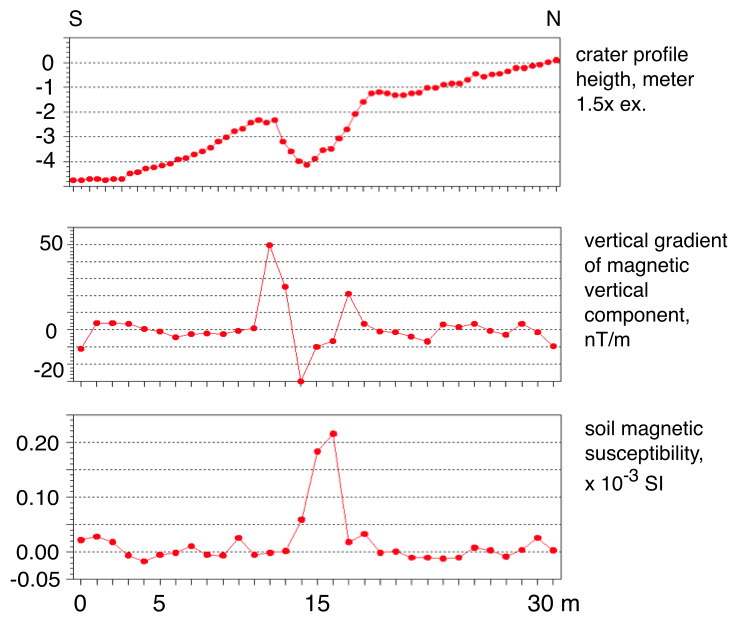 Topography, magnetic anomalies and magnetic susceptibility data on a profile across the Kaltenbach crater, Chiemgau impact, Germany. Fig, 6. 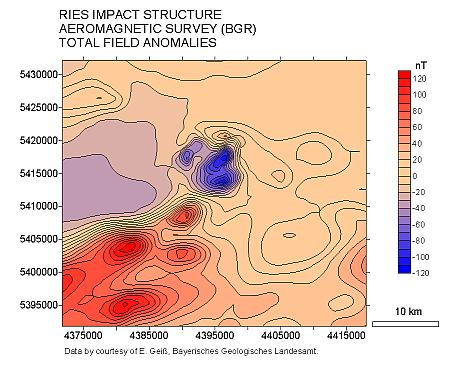 Topography, magnetic anomalies and magnetic susceptibility data on a profile across the Mauerkirchen crater, Chiemgau impact, Germany.